This entry was posted on October 26, 2012 by Tinteán Editorial Team/EMcK, in Book review. Bookmark the permalink. At the launch of Patrick Morgan’s book in the State Library of Victoria on the 16th October, Fr Paul Duffy claimed that this was an ‘important new book’. In our present secular society highly critical of the institutional Church, it is timely to recall another era when the Catholic Church was ‘under siege’ – from sectarianism rather than secularism – and was served actively and faithfully not just by clerics and religious, but by a committed, influential and farsighted Catholic laity. Indeed the Church in Melbourne at the turn of the 20th century had established a productive and radical collaboration between clergy and laity which served it well. Fr Duffy wryly remarks that, ‘Some of the questions raised then about the place and role of religion in secular society remain with us still.’ Perhaps some indications of the role the laity might play in the present situation could be gleaned from this ‘splendid work of scholarship and historical interest’. It’s true, I think, that for many people the history of the Catholic Church in Melbourne really began with the coming of Archbishop Mannix. He led the archdiocese for nearly fifty years; he was a commanding presence; and the Church here was closely identified with him. Some would hold that what preceded his reign was rather like a curtain-raiser to the main event. But as Patrick Morgan demonstrates in his important new book, that is a flawed view. 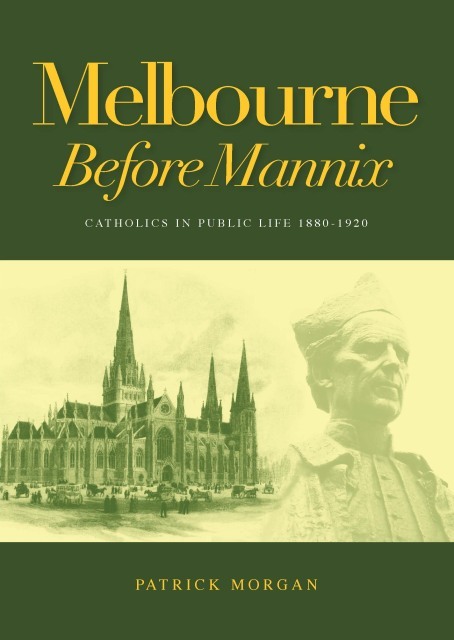 With his very impressive research he shows that in the pre-Mannix era clerical and lay activists together developed what he calls ‘a vibrant Catholic culture’ (1), and they played a significant part in the development of the broader social and political life of the Victorian colony. Histories of this earlier period (1880-1920) tell the story of the Church’s extraordinary expansion, as it tried to meet the needs of the rapidly growing Catholic population. They describe a church creating its great networks of parish churches, schools, friendly societies, hospitals, charity organisations, as well as its social, sporting and adult education associations. But by and large those histories are accounts of what the clergy – bishops and priests – did. Little was said about the lay people’s contribution. But as we follow Patrick’s narrative we find that several notable lay leaders, together with the clergy, made very significant contributions to the founding and leadership of important church organisations, and were informed and vigorous participants in public discussion of the major social and socio-religious issues of the time. In the decades before this period, two Catholics became leaders of the colonial government and one other led the government in the first years of the period studied here. The book brings to life the men and women of that era who established an astonishing range of publications – local weekly papers like The Advocate and The Tribune, and periodicals like Austral Light, with their essays on the arts and literature and their discussions of social and religious issues. This was part of a general plan to keep Catholics informed on key issues of the day – a kind of instrument for continuing education. In reading the profiles of these writers and editors one is struck by the range of their interests and the quality of their writings. One of the more notable of these was Marion Miller Knowles, a talented, versatile woman; a prolific journalist, poet and novelist, who helped found the Catholic Women’s Association and was involved in many charitable and social causes. These writers and thinkers were supported and encouraged in their work by their clerical leaders, in a kind of lay-clerical collaboration which many years later the Second Vatican Council was to recommend to the worldwide church. Patrick brings his narrative and analytical skills to bear especially on his account of the major subjects of public controversy which engaged the local Catholic writers – subjects like the Education Act of 1872 and state aid for Catholic schools; the place of Catholics in society and their relation to the various political parties; the coming of Federation; the conscription debates. And there was, of course, the continuing interest in the Irish question and Ireland’s quest for Home Rule. These debates are set in the context of social and political events occurring at the time in Ireland, Britain, Australia and, on a few occasions, Rome. In this period there were sustained attempts to provide continuing or adult education through organisations like the Catholic Young Men’s Society, and later there was the initiative to encourage Catholics to find their way into the world of the university and be at home there, through support systems like the Newman Society and later with the establishment of Newman College. On matters such as the place of the various religious groups in society and relations with political parties, the Catholic contributors helped the wider secular society define how a democracy was to proceed. This book has its inherent value as a history of an era of substantial achievements that were the basis for the church to move into its later periods of growth. It also poses some questions that are not confined to that period alone, but relate to later times as well. One is the relation of a church community to political entities. Patrick makes this connection in drawing parallels between earlier church forays into politics and the Movement, which B.A. Santamaria led in the 1940’s and beyond, and its engagement with the world of party politics. This is a subject that might benefit from further research and analysis. A second theme is spelt out in Patrick’s chapter called ‘Coping with Modernity’ and relates to the Church of the early 20th century trying to find ways of coping with desacralisation and the secularisation of society. Some of the questions raised then about the place and role of religion in secular society remain with us still. The third subject is the quality and style of leadership. In the Melbourne of Bishop Goold and Archbishop Carr there was a nurturing of lay leaders’ talents; their initiative and enterprise were encouraged. Their talents were allowed free play in the service of the church community. They were trusted. When they disagreed with the bishop on an issue like conscription, they were not denied their right to be heard. Within this style of leadership was a conception of the church as a genuine community of believers: a model of the church endorsed by the Second Vatican Council. The issues here are typified in the contrasting styles of leadership in the Melbourne Church and the Sydney Church of those early years, exemplified especially in what Patrick writes about the two Sydney Catholic Congresses and a Melbourne one in the first decade of the 20th century: The Sydney congress was a top-down occasion, tightly controlled, with hierarchy and favoured clergy giving most of the presentations … detailed argument was closed off (117). The Melbourne Congress was more open, with more lay participation, a more flexible agenda and fuller discussion of the topics raised’ (118). Questions remain with us still about the most suitable model of church, and the kind of leadership that will truly benefit the Church community and its engagement with the world beyond its borders. This book is the story of a part-migrant religious community trying to find its way in a pioneering community of various competing religious and secular elements. It’s an absorbing story told with style and built upon most impressive research. As well as telling a most interesting story, it raises enduring questions for our own time. We are indebted to Patrick for giving us this splendid work of scholarship and historical interest.